Kaup, Oct 17, 2017: A speeding government jeep fatally knocked down a pedestraian at Kaup Koppalangady on October 17, Tuesday morning. The deceased has been identified as Rajesh (23), a resident of Nandikur Kolachur. 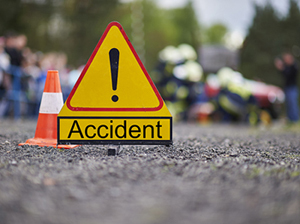 He was walking by the roadside near the community hall at Koppalangady on the NH 66 when the jeep belonging to the Fisheries Development Corporation knocked him down. Rajesh who was critically injured succumbed in the hospital. The deceased Rajesh was an orphan who grew up in the house of Aithappa Poojay of Nandikur. He was working in a hotel at Belagavi. Sources said he was mentally ill.
Kaup Police have registered a case.